Mayor James R. Fouts honors CERT leaders with a Ceremony at Warren City Hall. 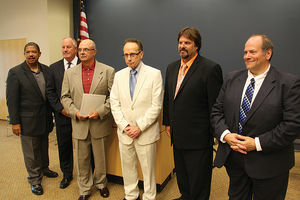 Mayor James R. Fouts honors CERT leaders in Warren. Warren Mayor James R. Fouts recognized leaders of the Warren Community Emergency Response Team (CERT) in a ceremony that honored the group’s efforts and offered words of thanks to the men and women who respond to emergencies. CERT is a volunteer based organization affiliated with The City of Warren Police and Fire Departments. CERT offers training and preparedness classes and is instrumental in assisting professional emergency responders. “They (CERT) perform a valuable task. Their contributions are priceless,” said Mayor James Fouts in a statement. This entry was posted in Community Development, James Fouts, Mayor, Safety Initiatives and tagged CERT, mayor jim fouts, warren, warren mayor jim fouts. Bookmark the permalink.